How do you protect your Italy property budget? Buying a property in Italy is an exciting prospect, but make sure you plan your finances carefully to ensure you don’t lose money on your currency transfers. Current political instability has caused the markets to fluctuate wildly and it is more important than ever to protect your budget when buying abroad. The Property Buyer’s Guide to Currency will provide you the platform that you need to make informed decisions about your budget. 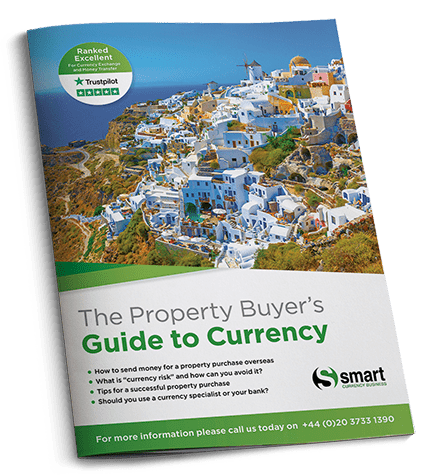 The guide is produced by Smart Currency Exchange, a company from whom we regularly hear fantastic feedback from our Italy Property Guides readers. They are ranked number 1 for Currency Exchange and Money Transfers on Trustpilot and they are also trusted by companies such as Rightmove. In clear and simple steps, it gives you a strategy for protecting your costs for your dream move to Italy. Our trusted team of experienced estate agents, tax and financial advisors, bilingual lawyers, and clued up expats, are on hand to help guide you through every step of your buying journey. This team includes our expert expat, Julia from Puglia, who shares her knowledge of buying and living in Italy to help you make a success of your move. Julia writes free articles and newsletters for our readers, which cover every aspect of buying in, moving to, and living in Italy. Our Resource Centre in London is on hand to make sure your Italian property purchase is a success. Our team is here to answer all your questions, to share knowledge of Italy’s different regions, and to offer advice on every step involved in buying property in Italy. Our team will also be able to put you in touch with the right professionals to help you realise your dreams of buying in Italy.